This chapter covers how to write and generate code in Android Studio. Android Studio uses its knowledge of object-oriented programming to generate extremely relevant and well-formed code. Features covered in this chapter include overriding methods, surrounding statements with Java blocks, using templates to insert code, using auto-completion, commenting code,and moving code. If your goal in reading this book is to master Android Studio, you will want to pay particularly close attention to this chapter because the tools and techniques described here in will have the greatest effect on your programming productivity. Let’s get started. If the HelloWorld app you created in Chapter 1 is not already open, go ahead and open it now. Code folding is one way of conserving screen real-estate in the Editor. Code folding allows you to hide particular blocks of code so that you can focus exclusively on those blocks that are of interest to you. If MainActivity.java is not open, open it by pressing Ctrl+N | Cmd+O and typing Main. Open the MainActivity.java class by pressing Enter, as seen in Figure 3-1. If line numbers are not showing by default, navigate to Help ➤ Find Action. Type show line numbers and select the option for the Show Line Numbers Active Editor, as shown in Figure 3-2. <翻译>如果行号默认没有显示，导航到Help ➤ Find，输入show line numbers并且勾选Show Line Numbers Active Editor这一项，如图3-2. that has been folded, or collapsed. A fine dotted line called the folding outline is located along the length of the left margin,between the gray gutter and the white Editor. The folding outline can contain three icons:the plus icon enclosed in a box (as in line 3 of Figure 3-3) and the up- and down-arrows,which have horizontal lines (see lines 12 and 15 of Figure 3-3) inside them. The down-arrows indicate the beginning of a foldable block of code, whereas the up-arrows indicate the end of a foldable block of code. A plus box, as mentioned, indicates that a block of code has been folded. Clicking any of these icons toggles the corresponding block to either its folded or unfolded state. Table 3-1 contains descriptions and keyboard shortcuts for all the code-folding operations. Place your cursor anywhere inside the onCreate() method of MainActivity.java. Now press Ctrl+Period | Cmd+Period a few times to toggle this block expanded and collapsed. Also try using the Expand keyboard shortcut Ctrl+Numeric-Plus | Cmd+Numeric-Plus and the Collapse keyboard shortcut Ctrl+Numeric-Minus | Cmd+Numeric-Minus. icons in the folding outline. Keep in mind that folding a single block, multiple blocks, or even all the blocks in a file simply removes them from your view in order to save screen real-estate. The compiler, however, will still try to compile them when you build. Similarly, folding a block containing problematic or erroneous code will not remove any warnings or errors from the marker bar. You can change the code-folding options by selecting the menu option Settings ➤ Editor ➤ Code Folding. <翻译>总之通过点击在折叠边框内的代码折叠图标折叠/展开你的代码块，记住，折叠单个块，多个块，或一个文件的所有块，是为了节省屏幕空间从你的视线中删除了，然而当你bulid的时候，编译器仍然会编译他们。类似的，折叠一个包含了问题的、有错误的代码的块将不会从标示条删除任何警告或者出错。你若要改变代码折叠的选项，请选择通过菜单选线进入Settings ➤ Editor ➤ Code Folding. 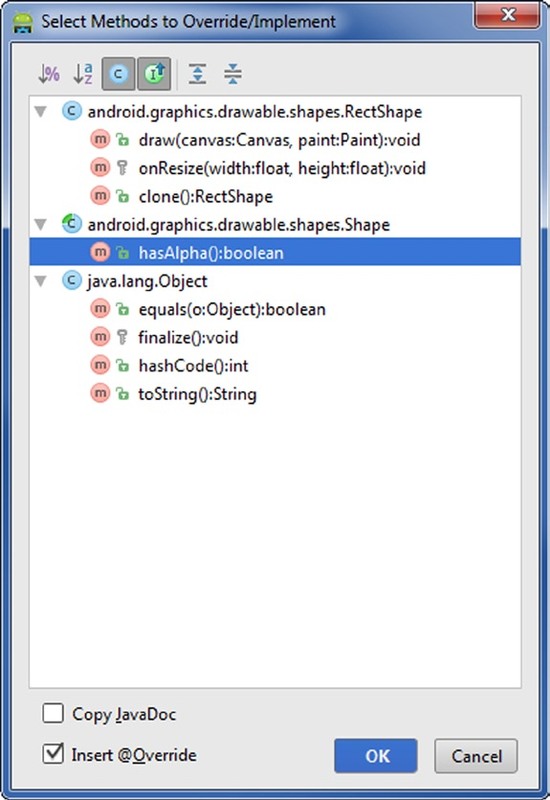 Most contemporary IDEs offer some form of code completion, and Android Studio is no exception. Android Studio is always ready to help, even if you’re not actively seeking help. In practice, this means that Android Studio will suggest various options for completing your code by default as you type. The suggestion list generated by Android Studio is not always perfect, but the suggestions are ordered according to best practices, and they typically conform to proper naming conventions. Android Studio understands both the Android SDK and the Java programming language very well; in fact, it probably knows these subjects far better than you do. If you approach this tool with humility and an eagerness to learn, you will end up looking like a rock star, no matter what your former programming experience may be. The code-completion features are context sensitive, insofar as the suggestions offered to you will be different depending on the scope of your cursor. If you’re typing code inside class scope, the code-completion suggestions will be different from those suggested to you if you were typing inside method scope. Even if you choose not to accept the code-completion suggestions, you should pay attention to them for the aforementioned reasons. - Default code completion occurs automatically as soon as you start typing. - Basic code completion behaves like Default code completion but also displays a Javadoc window next to the currently selected item in the suggestion list. - SmartType code completion also displays Javadoc but also generates a more selective and relevant suggestion list. - Cyclic Expand Word cycles through words already used in your source document and allows you to select them. Let’s start coding to demonstrate how code completion works. Right-click (Ctrl-click on Mac) on the package com.apress.gerber.helloworld and choose New ➤ Java Class to bring up the Create New Class dialog box, shown in Figure 3-4. Name this class Sandbox and click OK. Inside the enclosing brackets of the Sandbox class in Sandox.java, begin to define a member by typing private Li, as shown in Figure 3-5. A code-completion menu appears with a list of possible choices for you to complete your code. Use the up- and down-arrow keys to navigate the code-completion menu. Select the option, List<E>, with your down-arrow key and press Enter. The default behavior in Android Studio is to display the code-completion suggestion list when you start typing. You do not need to activate any keyboard shortcuts to invoke Default code completion—it happens automatically. You should now have a line of code that reads private List, as shown in Figure 3-6. Directly following the word List, type the left angle bracket (<) used for defining generics in Java. Notice that Android Studio closes the bracket clause with a closing right angle bracket and places your cursor inside the brackets. by pressing the Enter key. One of the best features of Android Studio is that it suggests variable names for you. Type a space directly after private List<String> and activate Basic code completion by pressing Ctrl+Space. Android Studio generates a suggestion list, but none of the variable names is sufficiently descriptive, so type mGreetings instead. Lower-case m stands for member (a.k.a. field), and prefixing class member names with m is the naming convention in Android. Likewise, static class members are prefixed with lowercase s. You are not required to follow this naming convention, but your code will be more easily understood by others if you do. Keep in mind that local (method-scoped) variables do not follow the m and s prefix-naming convention. 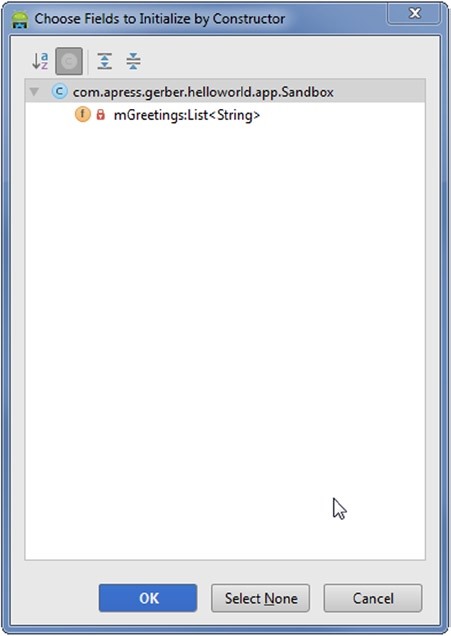 Modify your line of code so that it now reads private List<String> mGreetings = new. Invoke SmartType code completion by pressing Ctrl+Shift+Space. Select ArrayList<>() to complete this statement, including the terminating semicolon, as seen in Figure 3-7. SmartType code completion is similar to Basic code completion except that it factors in a wider scope of variables than both Default and Basic code completion when generating items in its suggestion list. For example, when using SmartType code completion on the right side of an assignment operator, the suggestion list will often include relevant factory methods. Note If your JDK in Android Studio is set to 7 or higher, then generated code from code-completion may use Diamond notation. For example, ArrayList<String> may appear as ArrayList<> on the right side of a declaration with assignment statements using generics, such as the one in Figure 3-7.
from your cursor, rather than up and away. If you’ve done any programming at all, you know that comments are lines of code that are ignored by the compiler but that contain messages or metadata that are important to coders and their collaborators. Comments may be line comments that start with two forward slashes or block comments that begin with a forward slash and an asterisk and end with an asterisk and a forward slash. From the main menu, you can activate comments by choosing Code ➤ Comment. However, the best way to activate comments is by using the keyboard shortcuts listed in Table 3-3. 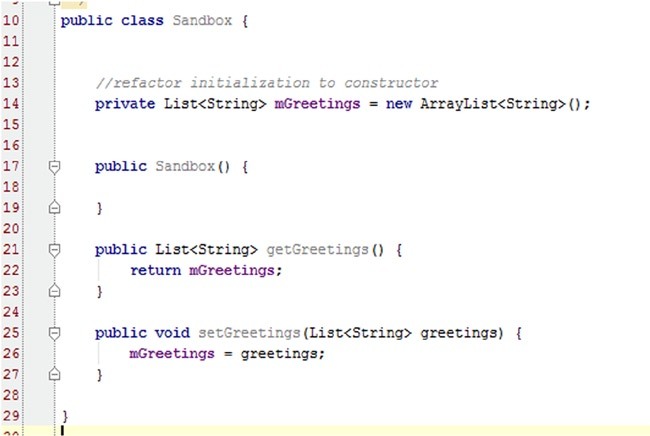 Type refactor initialization to constructor above the mGreetings declaration. Press Ctrl+/ | Cmd+/ to convert this text to a comment, as shown in Figure 3-7. Experiment with toggling this comment on and off by using the keyboard shortcut Ctrl+/ | Cmd+/. <翻译>类型重构初始化被构造，并放在mGreetings 声明的上面，Ctrl+/ | Cmd+/ 把其转化为注释，如图3-7，在开启和关闭注释切换实验，只需使用快捷键Ctrl+/ | Cmd+/. When used appropriately, code generation is the feature that will save you the most time. Code generation has the power to generate a variety of methods for you, including constructors, getters, setters, equals(), hashCode(), toString(), and so on.Before using code generation, let’s verify that Android Studio is configured properly to ignore the member name prefixes m and s. Click File ➤ Settings ➤ Code Style ➤ Java ➤ Code Generation to bring up the Settings dialog box with the Code Generation tab selected. If the Field and Static Field text boxes do not contain m and s respectively, type them there now and click Apply and then OK, as shown in Figure 3-8. <翻译>恰当的使用代码生成功能，这一特色将为你节约大量的时间，代码生成是生成各种方法的的强大功能，包括了构造，getters, setters, equals()，hashCode(), toString(),方法等等。在你使用代码生成之前，确认Android Studio 是配置好了，可以忽略成员名称的前缀，如m和s，点击File ➤ Settings ➤ Code Style ➤ Java ➤ Code Generation将得到设置对话框，将会出现代码生成的标签页，如果域和静态域文本框不包含m和s，则键入他们并点击”应用“和”确定“，如图3-8. parameters. You could, for example, invoke this dialog box again and generate a constructor that takes a List<String> as a parameter and assigns this parameter to our member mGreetings:List<String>. methods typically come in pairs, so unless you have a good reason to omit one or the other, it’s best to generate both in one fell swoop. Select Getter and Setter from the list, as shown in Figure 3-10. In the subsequent Select Fields to Generate Getters and Setters dialog box, select mGreetings:List<String> from the list and click OK. 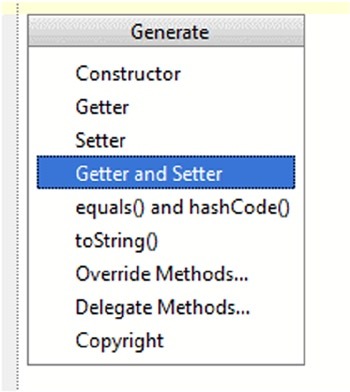 Your class now has a getter and a setter for mGreetings, as shown in Figure 3-11. Notice that the generated code ignored the m prefix when generating the method names, because you declared m and s as prefixes in Settings earlier. If you invoke Hierarchy View by pressing Ctrl+H, you will see the class hierarchy of Sandbox with RectShape, Shape, and Object as its ancestors, as you can see by examining Figure 3-13. Now press Alt+Insert | Cmd+N and select Override Methods. Let’s override the hasAlpha() method from Shape, as shown in Figure 3-14. The convention since version Java 5 is to annotate overridden methods with @Override, so let’s leave the Insert @Override check box selected. The @Override annotation tells the compiler to verify both the name and the signature of the method to ensure that the method is, in fact, being overridden. Modify the return statement of hasAlpha() to always return true. Android Studio knows about your class members and thus allows you to delegate behavior from a proxy method defined in your class to a method of your class member. That sounds complicated, but it’s easy. To show you how the Delegate Methods option works, let’s jump right into the code. In Sandbox.java, place your cursor in class scope. Press Alt+Insert | Cmd+N and then select Delegate Methods. Select the mGreetings:List<String> and press OK. The List interface has a lot of methods to which you can delegate behavior. For simplicity, choose add(object:E):boolean, as shown in Figure 3-16. If you want to delegate multiple methods, hold down the Ctrl key (Cmd key on Mac) while selecting those methods. Click OK. The generated add() method in Sandbox.java is now a proxy that delegates behavior to the add() method of the mGreetings member, as shown in Figure 3-17. Notice that the parameter to the add() method is defined as a String to match mGreetings’ generic definition, List<String>. Delegated methods are not overridden methods, so you can rename your proxy method to whatever you want, but the name add() makes perfect sense, so go ahead and leave the name as it is. Android Studio comes with many templates that allow you to insert predefined code directly into your source files. In many IDEs, the generated code is just pasted from a template without regard to scope; however, Android Studio’s templates are scope-aware and can integrate variable data as well. Before you start using live templates in Android Studio, let’s explore the existing live templates and create one of our own. Navigate to File ➤ Settings ➤ Live Templates. Select the Plain template group. Now click the green plus button in the upper-right corner and select Live Template. Populate the Abbreviation, Description, and Template text fields, as shown in Figure 3-18. Before this template can be applied, you must click the Define button, which looks like a blue hypertext link along the bottom of the window. Now select Java and select all the scopes (Statement, Expression, Declaration, and so on). Click Apply. You just created a custom live template called cb, which will be available while coding in any Java source file and in any scope. The red word $SELECTION$, shown in Figure 3-18, is a variable. You will see this variable in action shortly. 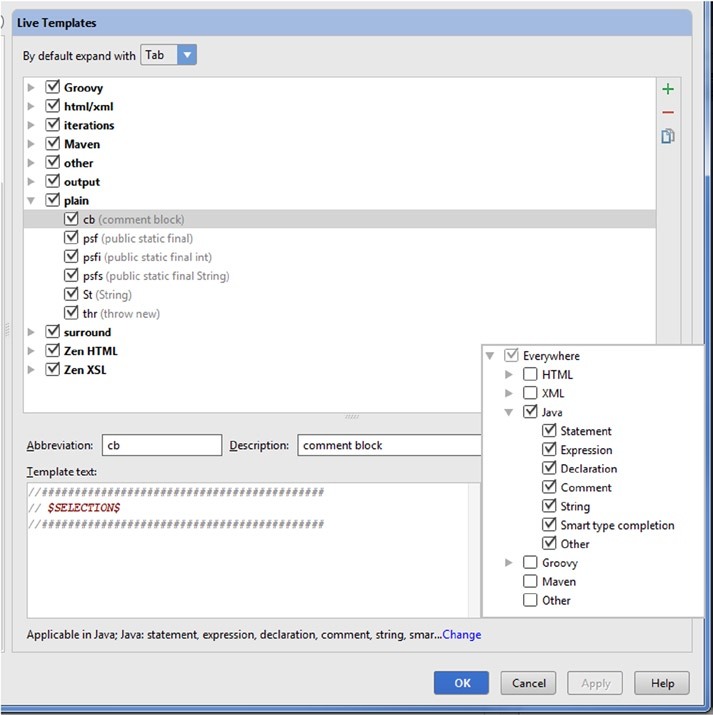 The Live Template options are described in Table 3-4. Before leaving the Settings page for live templates, take a quick look at one of the existing live templates whose abbreviation is psfs, located in the Plain template group. Click psfs to inspect its contents. You will notice that this template generates a String constant with public static final String and that it is available in Java and Groovy declaration scopes only. Click OK to return to the Editor. In the declarations section of Sandbox.java, underneath the definition of mGreetings, type psfs and then invoke live templates by pressing Ctrl+J | Cmd+J and then press Enter. Complete this statement by giving this constant a name and an assignment like so: public static final String HELLO = “Hello Sandbox”;. Template. Select cb from the Live Templates list and press Enter, as shown in Figure 3-19. You just applied the live template you created earlier. Android Studio understands how code blocks are delimited, so moving either lines or blocks of code is easy and intuitive. The difference between Move Statement and Move Line is that Move Statement respects both boundaries and scope, whereas Move Line respects neither. If you choose to move a statement of code with Move Statement, the statement will remain inside the boundaries of its enclosing block scope. If you move that same statement with Move Line, Android Studio treats the statement as a simple line of text, and will move it wherever you want it to go. You can also move entire blocks of code. With Move Statement, all you need to do is place the cursor anywhere on the opening line (the one with the open curly brace) of the block you want to move and press Ctrl+Shift+Down | Cmd+Shift+Down or Ctrl+Shift+Up | Cmd+Shift+Up. The entire block will move en masse while respecting the boundaries of the other blocks and staying within the boundaries of its enclosing scope. Move Line doesn’t understand scope or boundaries, but you can still move multiple lines by selecting them first before applying the Move Line Up or Move Line Down operations, which are Alt+Shift+Up and Alt+Shift+Down, respectively, on both PC and Mac. To understand move operations in Android Studio, it’s best to just do them. Let’s start by creating a statement in our add() method. Directly after the line that reads return mGreetings.add(object);, press Enter to start a new line and type soutm. Then press Ctrl+J | Cmd+J to invoke Live Template, which produces System.out.println("Sandbox. add");. You may have noticed that your new line of code will not be reached because the return statement is above it, as shown in Figure 3-20. Let’s move this statement with Move Statement Up. While holding down Ctrl|Cmd and Shift, press the up-arrow key multiple times. Android Studio repositions the statement, but does not let you accidentally move this statement into a scope where it may not make any sense. Try this operation again with Move Line (Alt+Shift+Up) and observe its behavior again. Let’s try another example to demonstrate the power of Move Statement by moving your constructor to the bottom of our class. Make sure that there are no empty line breaks between the Sandbox() declaration and the comment block above it. Now, place your cursor anywhere on the declaration line of Sandbox() and invoke Move Statement Down by holding down the Ctrl|Cmd and Shift keys while pressing the down-arrow key repeatedly until your constructor is the last method in the class. Notice that the entire block, including the comment, leapfrogged down to the bottom of the class, avoiding the other methods along the way. 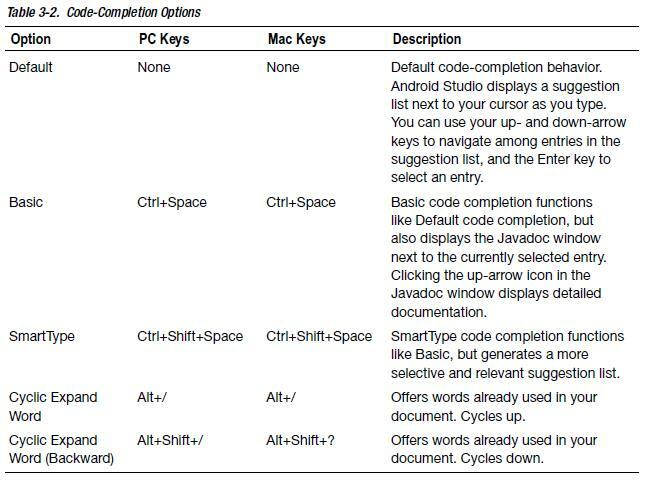 The Move Code operations and their keyboard shortcuts are described in Table 3-5.
let’s examine the Settings for Code Style. 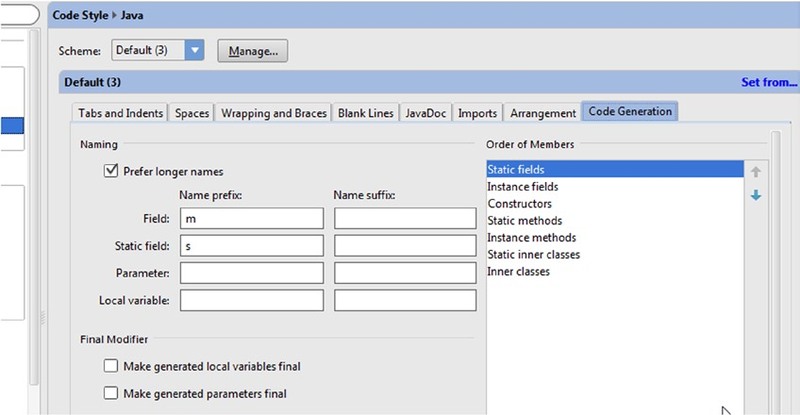 Choose File ➤ Settings ➤ Code Style to bring up the Settings dialog box, shown in Figure 3-21. Java and XML are the languages we’re most interested in for Android. 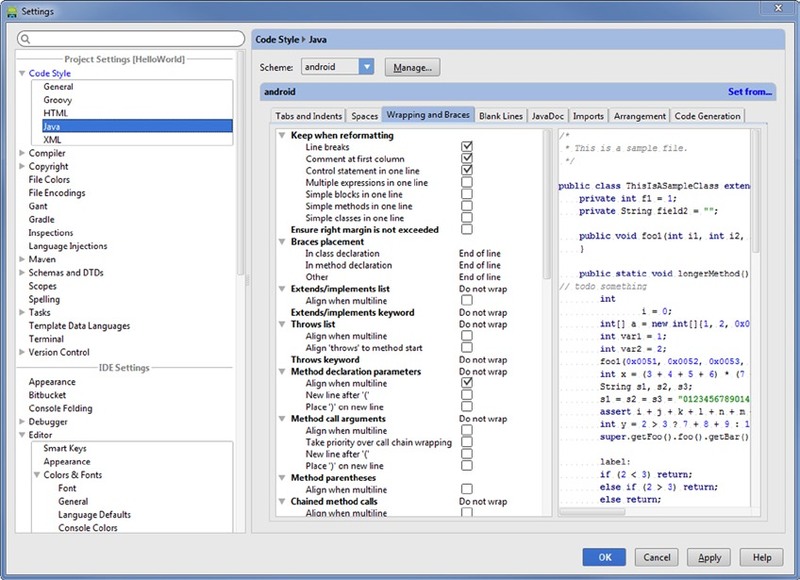 Toggle open Code Style in the left pane, select Java, and examine each tab in the Settings window. Experiment with these settings by selecting/deselecting the check boxes in the middle pane of the various tabs and notice how the sample class in the right pane changes accordingly to suit your style. Click the Manage button along the top to define a new scheme. Now click Save As and give your scheme a name, such as android, and click OK. If you make further changes to a saved scheme, click the Apply button to apply them. When you format your code with Ctrl+Alt+L | Cmd+Alt+L, the settings you chose in the Code Style tabs will be applied. The code-organizing options are described in Table 3-6. Auto-Indent Lines is useful for keeping lines indented properly as you code. The rules that govern tabs and indents in Java are accessed via File ➤ Settings ➤ Code Style ➤ Java ➤ Tabs and Indents. Auto-Indent Lines is applied to the current line, or if you have multiple lines selected, to all the selected lines. In Sandbox.java, select an entire method block of code and press Tab. The block should move one tab distance to the right. Now place the cursor on the first line of that block and press Ctrl+Alt+I on both PC and Mac. You will notice that Auto-Indent repositions that line to the appropriate indent position, although the rest of the method block remains unaffected.Now select all the code in the class by pressing Ctrl+A | Cmd+A and again press Ctrl+Alt+I.This time, proper indentation is applied to the entire file. Arrangement governs the order of the elements in your code. For example, most people prefer to keep class member declarations at the top of their classes, followed by constructors, followed by getters and setters, and so on. You can edit the Arrangement settings from the Arrangement tab accessed via File ➤ Settings ➤ Code Style ➤ Java ➤ Arrangement.In the previous section, you moved the constructor to the bottom of the class. This is not typically where it belongs. Choose Code ➤ Rearrange Code from the main menu. You will notice that your constructor has moved back to its expected position, below the declarations section. Rearrange Code performed this rearrangement operation according to the rules in the Arrangement settings. Reformat Code is the most powerful of the Code Style actions, as it gives you the option to apply all the code style options defined in the Code Style settings. As you’ve already seen, the Code Style settings can be accessed from the main menu via File ➤ Settings ➤ Code Style. In addition, Reformat Code allows you to reformat the currently selected file, or every file of the same type and directory. Furthermore, Reformat Code allows you to chain Rearrange Entries (which will apply Rearrange Code on Java files), and Optimize Imports onto the command, as shown in Figure 3-22. Try reformatting Sandbox.java by pressing Ctrl+Alt+L | cmd+Alt+L. Surround With (Ctrl+Alt+T | Cmd+Alt+T) is a superset of the functionality found in Surround with Live Template (Ctrl+Alt+J | Cmd+Alt+J). However, Surround With also includes options to surround a selected statement or statements with a Java block such as if/else, for, try/catch, and so on. Although the simple code in your Sandbox class does not threaten to throw any checked exceptions, surrounding statements that threaten to throw exceptions with try/catch blocks is among the best application of Surround With; and this is probably why the keyboard shortcut Ctrl+Alt+T | Cmd+Alt+T includes a T. The Surround With operations are described in Table 3-7. 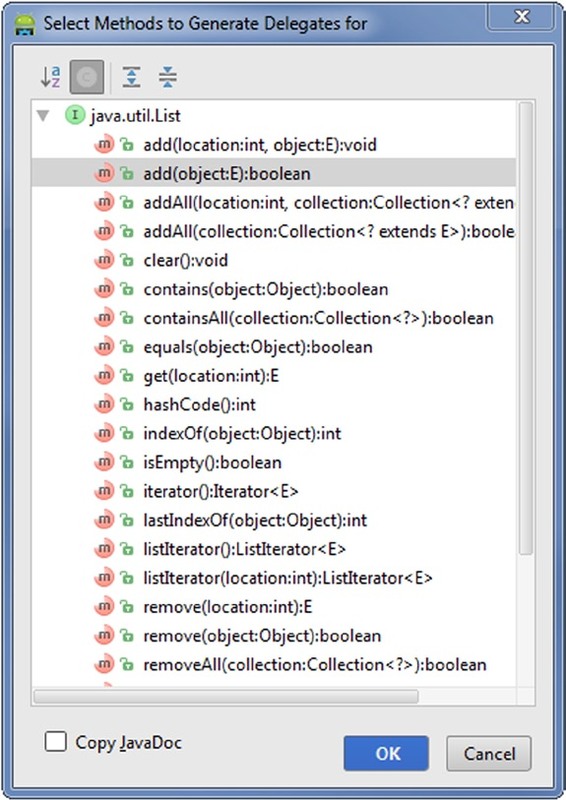 In the add() method of Sandbox.java, you want to ensure that there are no duplicates. Let’s surround the return mGreetings.add(object); with an if/else block, as shown in Figure 3-23. Select that entire line and press Ctrl+Alt+T | Cmd+Alt+T to activate Surround With. Now select if/else from the menu. In the parentheses of the if statement, type !mGreetings. contains(object) and in the else block type return false;. Say your business rules have changed and you don’t care about duplicate entries in mGreetings anymore. Use Unwrap/Remove to remove the if/else block you just created. Place your cursor anywhere on the return mGreetings.add(object); statement, press Ctrl+Shift+Delete | Cmd+Shift+Delete, and select unwrap if. The method should now look as it did before you modified it. Another great application of Surround With is iterating over collections. In the previous section, you auto-generated a toString() method. Now change this method so that you iterate over the mGreetings collection. Remove the return statement from the toString() method so that the body of the toString() method is empty. Now type mGreetings and then press Ctrl+Alt+T | Cmd+Alt+T. Select Iterate Iterable from the list, or press the I key. Press Enter again to accept greeting as the name of the individual element. The resulting code is a for-each loop. Notice that Android Studio understood that mGreetings contains Strings, and that it also generated a local variable called greeting with the singular form of mGreetings less the m. Modify the add() method further, per Figure 3-24. This chapter covered the most important code-generation features of Android Studio. We encourage you to return to File ➤ Settings ➤ Code Style ➤ Java and File ➤ Settings ➤ Code Style ➤ and spend a few minutes exploring the various settings there. Android Studio provides a lot of keyboard shortcuts for coding, but you don’t have to remember them all. If you get overwhelmed, you can use this book as a reference, or navigate to the Code menu and explore its menu items and submenus as a reference. Sohnyi - no zuo no die,i want to try.